training and experience, we are failing the great American dream." If this is true then, “Houston, we have a problem." 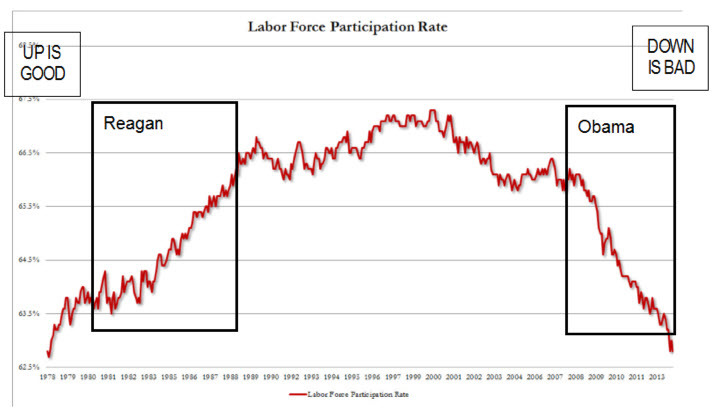 Labor Force Participation (LFP) Rate - Working full or part-time includes Americans & foreign born. Civilian Potential Labor (CPL) - Able to work age 16 to 65 not incarcerated not military & DoD. Happiness is a product of work. The “Pursuit of Happiness” is an inalienable right. Happiness is a product of work. Everyone needs to work this is natural law. If you are in denial of this basic human requisite then read no further. Clear back in 1943 Abraham Maslow articulated the “Hierarchy of Needs” and nearly all later studies have confirmed that the five (5) needs: Physiological, Safety, Love/belonging, Esteem, and Self-actualization as fundamental to human progression. Unbelievable, how can such financially successful people be so totally naive and ignorant about the true meaning and purpose of life? When Branson has his pilots at Virgin Air work only half days maybe then he can be taken seriously. While one person could provide what Maslow calls the “Physiological” needs (i.e., “housing, security”) for another person. The only possible way for an individual him or herself to progress to Maslow level 2, 3, 4 or 5, is by providing for his, or her, own “Physiological” needs which means engaging in productive employment (a.k.a. get a job, do any kind of work). “Man does not live by bread alone.” Jesus Christ. Christians believe caring for the poor means teaching them how to fish. A Christian ministry, or church, sees its mission as teaching its members how to teach others how to fish. This is not religious dogma it is simply pointing out natural law. Basic conservatism embraces work as essential to happiness; even more importantly any policy, stigma, or program, that discourages an individual from wanting to work or disincentivizing her or him in any way is a violation of natural law. Poverty is when individuals are not attaining their basic needs by way of their own efforts. To rely on someone else to supply ones basic needs with no way to get out from under the suppliers control is poverty (a.k.a. slavery). Government assistance keeps people in poverty. It robs them of initiative. Charity means showing people their way out of poverty. People come to America because they want to take care of themselves. 1. Training -Learning to work, intern, apprentice --role for secondary education ages 14 to 17; training is ongoing a lifetime pursuit. 2. Unemployed -In reality unemployment is the hardest work of all. Sending resumes, calling employers, research jobs requirements & company backgrounds, interviews and zero percent (%) reusable let alone compensated. 3. Money Needs -Work a job I don’t like to get money for things I want or need. 4. Career -Chosen work that one has been trained to do and/or enjoys or loves to do. 5. Post Career -Volunteer or part-time-paid -because work is meaningful and life fulfilling. We can establish that work is an act of being gainfully employed and it is a natural and necessary characteristic of every living person. Some, a small number, and because of either retirement or financial security, may gain daily success by way of volunteer work. However, everyone needs some form of work to be contributing members of society as well as fulfilling their own spiritual requirements. Some need to work because of financial necessity, while others choose to work because they understand it brings meaning to their lives. This latter group does not need the money however, money is a key indicator and measure of the value of one’s work. An honest days work is among the most truly fulfilling of all activities on earth. Those of us who have accepted the existence of an afterlife know that work (especially good works) will be the standard in that eternal existence. This is what employment is and the reason we need lots more jobs. For example currently (2013) in the U.S. nearly 70% of retirees choose to continue to work for pay. Many part-time, however a significant number do so for the pure joy that work brings to them and their families and associates. Why do you suppose Betty White (at age 93 and completely financially secure) is still working? Why does multi-millionaire Nancy Pelosi (age 74) keep working? Well in her case it’s about power. George Burns worked until he died at 100 years of age. Started singing in the Pee-Wee Quartet at age 6, after spending time working as a candy syrup maker. The child, George Burns, working at age 6 brings up the whole area of family businesses especially farming, movies, entertainment (e.g., Duck Dynasty), and others. Where entire families work and children are essential for the families’ success. More needs to be done to preserve this purposeful lifestyle choice while at the same time being aware of abuse or exploitation of children. Child labor in and of itself is not abuse. Requiring a child to work is not abuse, in fact allowing a child to avoid work is the real abuse. The conditions of the work and the abusive conduct of parents or “bosses” are the issues. Work Myths Let us clear up any myths about work. “Old people need to get out of the way” - a myth and a lie. Let us completely disregard any discussion about retirees, a.k.a. seniors, needing to move over so there will be more job openings for younger workers. That is simply unacceptable, it’s down right unAmerican. The “right” to work is a necessity and everyone has a right to earn their own way. In fact any policy, doctrine, or government program that in anyway discourages or even disincentivizes any able bodied or able minded individual from accepting and fulfilling this inalienable right is wrong. The tragic results are well documented and all around us are examples of the “idle rich” and the something-for-nothing crowd. Meaningful and honest work is a basic requirement for success, family and personal. With sufficient jobs (more jobs than workers) there is no need for minimum wages, no need for price controls, no need for import tariffs, no need for government workplace regulations, no need to remain working at a job you hate just of the medical insurance. Health care and other so called “golden handcuffs” should not be connected to any job. Individuals must be able to procure transportable insurance plans in the free market. They may negotiate for their employer to pay the premiums while employed, but the policy ownership title remains with the individual not the employer. A definition of slavery is dependency on someone other then oneself for essentials of living. Especially if compelled or forced to perform. Governments role in the jobs market must be limited to only assuring of rights of each individual to take care of him or herself. Bigger and bigger government advocates, especially Secular-Progressives (S-P) fail to understand, work as a right, a necessity, and when you offer assistance without accountability it is like a spiritual death sentence. This is the case with all “government” assistance. As an example, the “Welfare” program of the LDS Church (Church of Jesus Christ of Latter-day Saints, aka Mormons) all assistance (100%) is distributed at the sole discretion of the local bishop, a non-paid volunteer minister and leader of a congregation of around 500 members. No authority above a bishop is allowed to disperse funds for assistance to anyone within the geographical boundaries of that bishop’s ward. Not even the worldwide President of the Church has that authority. Only a bishop, who knows the recipient personally and has discussed that person’s needs with them, is the issue of Church assistance. The recipients themselves, when able, are encouraged to work assisting other members doing things like yard work, house work, mechanical repairs, or engage in Church or community service. Basic Judeo-Christian ethics require work; the purpose of life is to work. It’s not about the necessity of work rather about the morality of work vs the immorality of not working (or bearing ones own weight) in society. It is an essential attribute of human dignity and self respect. Self esteem if you prefer to call it that. The purpose of the United States is liberty and freedom for all. Inalienable Rights: life, liberty, and pursuit of happiness (e.g., property ownership, provide for my own care, and receive nothing from anyone or entity to which I am in anyway obligated). The single greatest concept of liberty is work. Freedom to work. To provide for the needs and desires of myself and my family through honest work. Nothing is even in the same room as far as needs or fulfillment of human need as is an honest days work. Anything that is less than that by cheating, not doing your best, scheming, or outright illegal conduct are from the dark side. The core of this is the very first act recorded of Cain killing his brother Abel. The act of murder is evil and but the reason why Cain was led to want to murder his brother may be the greater evil. He actually believed that he could gain advantage in life by taking it from someone else. This is lottery 101, 3-Card Monty, pyramid scheme, fraud, deceit, “something for nothing,” etc., etc. Regardless of your belief about God, the story of Cain and Abel whether real, which I believe, or not serves as the earliest recorded metaphor regarding murder and the reason or motive behind murder. Most men/women will never produce a great building, direct a major movie, but each and every person may produce an honest days work. Anyone may gain the satisfaction of accomplishment of doing something and being rewarded directly for having done so. Charity is important however the greater blessing of charity is to the giver not the receiver. This is why bureaucrats should not be givers. America is freedom. Freedom takes hard work. Liberty is ability to stay out of jail. To obey the law takes effort. If you want to play the saxophone with ease it takes effort. Soon it will appear to be easy like Kenny G but it is always hard work just fun. All work is effort just accept that. Even doing fun stuff takes effort, so why not choose to make work fun. Stop trying to figure out how to get something for nothing just earn what you need. Work is natural just do it. Actually Employed BLS (Full, P-T, & Involuntary Part-Time) & Self Employed -Done by Survey 60,000 US HH not actual data. UnEmployed (U-3) -Line-8B minus Line-9B (% is line-10B ÷ line-8B) – Confirmed by Survey not actual data. 100% Volunteers serving worldwide not paid work, e.g., missionaries, aid workers, et.al. 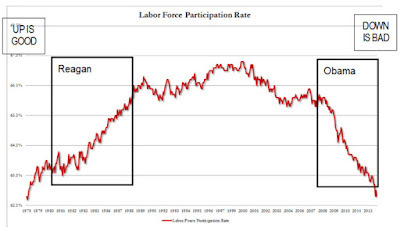 Sum of lines 15A to 23A is on Line-24A & represent the NEW Total of Who "Do NOT Participate in Labor Force" at 27% down from current 37%. *Does not include the 2.5 million FTE (full-time equivalents) lost from the disincentives attributed to the ACA (a.k.a. Obamacare). **Undocumented workers: counted in LFP, but not in population or CPL. No accounting for: black market or under-the-table workers. Incarcerated prisoners (are “employed”) 2.4 million p7. Ironically same # as MA&D Line-7. What about Americans working outside U.S. (Garrett in AZ) -not expatriates abroad (est. 2.2 to 6.8 mil). ***All college, high school, vocational students should be required, as part of curriculum, to maintain an internship, paid and with school credit. These internships wold be part-time during the school year and full-time during breaks -working at a business or government agency. Employer to Student ratio is 4:1 (every 4 workers : 1 intern). “university graduates”, job placement alignment with major field of study. Fact: Less than 20% U.S. jobs require 4 year college degree; universities are graduating 30%. Solution: Refund of tuition for graduates not getting jobs in alignment with major field of study or degree. A student may sign a waiver and give up the option for tuition reimbursement and take courses not recommended for jobs needed in real world. ABBOTT: Absolutely it goes down. That's how they get it to 7.8%. Otherwise it would be 14.7%. Our government doesn't want you to read about 14.7% unemployment.